It’s the end of the world as Carol knows it. Or is it? In Captain Marvel #2, written by Kelly Thompson with art by Carmen Carnero, Tamra Bonvillain, and letters by VC’s Clayton Cowles, Carol is faced with an “alternate reality” and the chance to lead a revolution. Nuclear Man has taken his battle with Captain Marvel to the other side of an impenetrable barrier. Fortunately, Carol isn’t alone because some of her allies and friends have found them on the same side of the barrier. The mysteries of the barrier are just beginning however, as it appears only women can get through the barrier and time doesn’t pass at the same rate on both sides. Kelly Thompson’s Captain Marvel feels very true to the other runs the character has had. She’s a no nonsense natural leader, and her military background is put to good use in organizing a rebellion. Plus she’s always ready to fight whomever (or whatever) to save her friends. 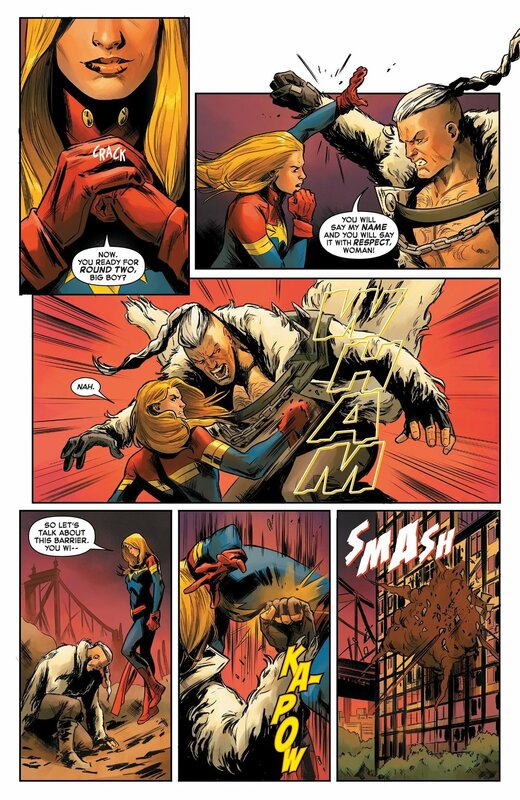 Captain Marvel is never afraid to take a hit or give one back and Carmen Carnero’s art feels perfectly suited to this. She doesn’t shy away from exploring a variety of poses and facial expressions that help bring the action of the story to life. Tamra Bonvillain’s coloring is a wonderful compliment to the linework. She contrast’s Carol’s well known color palette of red, blue, and yellow against the backdrop of the wasteland causing her to really stand out. Despite the background being done in more muted colors Bonvillain uses pops of color and depth to keep it visually appealing without overpowering the main focus; the characters. The team behind Captain Marvel is off to a great start and they will hopefully continue to improve. As a pilot, the sky’s the limit for Carol, and ideally, for her story as well.